Recently my friend, talented writer Jenny Checchia, asked me to contribute some of my sketches to her first book 'The Bridge,' a collection of poetry whose proceeds will go to the hunger-fighting charity The Hunger Project. I gamely sent off an array of doodles (many created with Crayolas) for her to choose from, and three (of my favorites)have made the final cut! 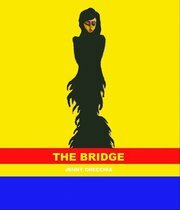 'The Bridge' is currently available in its Kindle Edition at Amazon and Barnes and Noble for only $5! The paperback edition will hit online stores in September. Get your copy today. *To be clear this image is not my work - you have to buy the book for mine.